Malaysia's sluggish property market is expected to recover in the second half of next year, in line with the country's improving economy. Real Estate and Housing Developers' Association (Rehda) chairman Datuk Michael K.C. Yam said based on the findings of its own survey, over half of members are optimistic the market will improve. "The respondents are optimistic that the property market will improve amid cautious optimism with houses between RM100,000 and RM250,000 expected to see good demand," Yam said in Kuala Lumpur yesterday at a media briefing on property updates. A total of 103 members participated in the survey. Rehda has about 900 members. Most developers agree the economy will recover next year with the government forecasting growth of 2 to 3 per cent. Only 21 per cent of respondents will maintain current prices for new launches while another 38 per cent said they will increase their prices. A majority expects property prices to rise by up to a fifth over the next six months. "Higher Employees Provident Fund withdrawal for subsequent home purchases and lower toll to encourage buyers to buy homes outside of Kuala Lumpur can improve the sector," said Yam. KUALA LUMPUR: The Malaysian property market is expected to improve next year in line with the expected improvement in gross domestic product. Real Estate and Housing Developers’ Association Malaysia deputy president Datuk Michael Yam Kong Choy said most developers were optimistic that the property market would recover beyond the second quarter of next year. “A continuous population growth, a low interest rate environment, low unemployment rate as well as easy access to financing, will boost demand for the property market,” he told a media briefing yesterday. Yam said there would be more new property launches next year, especially in the second half. On the implementation of the fixed 5% real property gains tax (RPGT) on Jan 1, Yam said the timing of the imposition was not right. He said the RPGT should be imposed only to curb speculation and not across the board. “If imposed at all, it should only apply to transactions within a specified period,” he added. Meanwhile, RAM Holdings Bhd economist Kristina Fong said the rating agency projected Malaysia’s GDP to grow by 4.9% next year. She said domestic-oriented services, as well as construction and manufacturing industries, will drive the modest recovery. KUALA LUMPUR: Malaysia Property Incorporated (MPI) will organise a property exhibition in India for Malaysian developers next year. The exhibition, at the Hyderabad International Convention Centre (HICC), is from Jan 21-23. "MPI is optimistic that the exhibition is an excellent opportunity to continue promoting Malaysia as a premier real estate investment," MPI chairman Datuk Richard Fong, said in a statement here, Thursday. MPI is a Malaysian government initiative set up to promote and brand Malaysia as an international property investment destination. It is driven by the International Real Estate Federation (FIABCI) Malaysian Chapter in collaboration with the Malaysian government, the Real Estate Housing Developers' Association (REHDA), the Malaysian Institute of Estate Agents (MIEA) and the private sector. PETALING JAYA: Hong Leong Bank Bhd expects its new mortgage loans to grow 10% in the first three months of the launch of the Hong Leong Flexi Mortgage yesterday. Yvonne Chia says customers can take a bigger loan amount while enjoying smaller monthly installments. The mortgage plan, which allows customers to defer payment of 15% to 35% of their total loans to the end of the loan tenure, would allow customers to take a bigger loan amount while enjoying smaller monthly instalments, group managing director and chief executive Yvonne Chia said at the launch of the new mortgage plan. Chia said housing loans now accounted for 58% of the total household debt. The bank’s personal financial services chief operating officer Moey Tan said the new product offered a monthly instalment of close to 7% of the loan amount for most of the loan tenure. The monthly instalment would increase near the end of the tenure. Tan is confident the new mortgage plan would appeal to homebuyers as most people would have a higher income nearing the end of their loan tenure. The Hong Leong Flexi Mortgage is for residential properties valued from RM200,000. It is targeted at first-time buyers and those looking to upgrade their homes. It has an interest rate of base lending rate (BLR) minus 1.8%. Hong Leong Bank’s current BLR is 5.55%. YTL Land and Development Bhd plans to buy a 50 per cent stake in PDC Heritage Hotel Sdn Bhd (PDC) for RM14.6 million. The deal is a related party transaction as PDC is a subsidiary of YTL Hotels & Properties Sdn Bhd. PDC owns a parcel of leasehold commercial land measuring about 1.4 hectare located along Lebuh Farquhar, George Town, Pulau Pinang. United we stand: (Fourth from left) Datuk Dr S. Subramaniam, Datuk Seri Idris Jala, Tan Sri Dr Koh Tsu Koon, Tun Abdullah Ahmad Badawi and Datuk Seri S. Samy Vellu at the launching of the Goverment Transformation Programme (GTP) at the Sunway Pyramid Convention Centre yesterday. The Government is trying to reach out to the 10 million poor people living in the rural areas by building more roads, providing low-cost housing, delivering clean water and electricity. It plans to build roads totalling 7,000km-long at an estimated RM10.5bil, supply treated water to 360,000 houses, construct new and restore 50,000 houses as well as provide electricity supply to 140,000 houses. “We will implement these projects within the next three years. “The clean water supply would be enough to serve an equivalent to the whole of Kedah’s population while the electricity supply would be enough to serve the whole of Malacca’s population,” said Basic Rural Infrastructure Lab leader Mohamad Sabari Shakeran. Mohamad Sabari said once the basic infrastructure of the rural areas had been addressed, social development and other matters would fall into place. “Can we deliver? Yes, we can. We have conducted a survey to see if we have enough contractors, supply and machinery to deliver these projects, and we have enough capacity. “Yes, there is also enough money but the prime minister will announce the allocation later,” he said. Mohamad Sabari said the lab had also identified internal red tape as one of the factors which would delay the implementation of government projects. “We have met up with the various agencies to shorten the process. “For example, the process for road construction open tender takes 136 days. “We have now shortened it to 71 days. This does not mean we are stopping here. “We are still looking into ways to shorten the process further. But this is a start,” he said. KUALA LUMPUR Equine Capital Bhd (ECB)'s wholly-owned subsidiary Taman Equine (M) Sdn Bhd today entered into a sale and purchase agreement with Tanjung Balai Sdn Bhd for the disposal of a leasehold land for RM28 million. In a statement, it said the 4.72-hectare land in Mukim Petaling, Selangor, was categorised as building land zoned for commercial use. It is charged to a local bank as part of the security of the ECB Group for a term loan facility. The land, acquired in 1994 at RM260,168, was revalued to RM8.7 million upon the listing of ECB in 2003 and further revalued to RM28.8 million as at March 2009. The land had been leased to Aeon Co (M) Bhd and the lessee had erected a building known as "Aeon Taman Equine Shopping Centre". The annual lease rental currently payable under the lease agreement is RM1.5 million. ECB said the proposed disposal was in line with the group's business strategy of disposing non-core assets to streamlime the business operations. Of proceeds, ECB said, RM10 million would be used to repay bank borrowings and the balance as working capital for its property development activities. Tanjung Balai Development is involved in property development and investment holdings. EQUINE Capital Bhd’s subsidiary is selling a 4.7ha plot of land in Selangor to Tanjung Balai Development Sdn Bhd for RM28 million. The company said the sale was part of strategy to get rid of non-core assets and streamline its businesses. Proceeds would be used to reduce borrowings and to provide working capital. Taman Equine (M) Sdn Bhd will use RM10 million to repay debt while another RM18 million will be for working capital. UEM World Bhd's chairman Tan Sri Ahmad Tajuddin Ali clinched the "Prominent Player Award" at the Malaysia Construction Industry Excellence Awards (MCIEA) 2009. The event, organised by the Construction Industry Development Board (CIDB), is an annual affair. Now in its 10th year, the award recognises individuals and companies that have excelled in the construction industry. IJM Construction Sdn Bhd was named "Contractor of the Year" for its work on Menara Bumiputra-Commerce in Jalan Raja Laut, Kuala Lumpur. 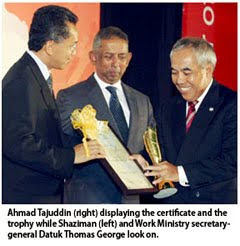 Trans Resources Corp Sdn Bhd's Datuk Sri Sufri Mohd Zain, meanwhile, was the recipient of the "CEO of the Year" award. Works Minister Datuk Shaziman Abu Mansor presented the winners with their certificates and trophies at the ceremony held at the CIDB Convention Centre in Kuala Lumpur on Wednesday. Thirteen recipients were honoured that day. The winner of the "Environmental Best Practices Award" went to Tanjung Mahsuri Sdn Bhd, while the "IBS Award" went to Spaz Sdn Bhd. The "Contractor Grade 1" award winner was Double R Enterprise, while the Grade 3 award winner was Gabungan Perintis Sdn Bhd, and Grade 4, Gilap Kualiti Enterprise. The "Contractor Grade 5" award went to HNA Terus Maju Holdings Sdn Bhd, while the Grade 6 and Grade 7 awards were given out to NKR Continental (M) Sdn Bhd and Sunway Construction Sdn Bhd, respectively. The "International Achievement Award" winner was Persys Sdn Bhd, for the work it did in improving Saudi Arabia's Jamarat Bridge and its surrounding area in Mina. CIDB said the MCIEA served as a platform to create healthy competition among industry players in adopting best practices in the implementation of projects.